I came across this article the other day regarding use of the daVinci robot to perform base of tongue surgery for obstructive sleep apnea. 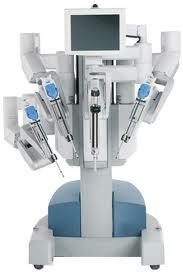 For those who don't know, the daVinci robot system made by Intuitive Surgical is a robotic system whereby the surgeon directs the arms of the robot to perform surgery in difficult-to-access areas of the body. My feeling is that using a robot to perform sleep apnea surgery is way overkill akin to using a $50,000 sniper rifle to kill an ant on the wall. Everything the daVinci robot can do can also be done without the robot with equivalent patient outcomes. In fact, without the robot, the surgery can be performed more quickly, efficiently, and with less anesthesia than with the robot. The article also describes sedated (sleep) endoscopy to determine WHERE the obstruction occurs during sleep. The areas of obstruction can than be precisely addressed surgically. Again, this does not require a robot. In fact, I would hazard to say that even the surgeons quoted in the article does not use the robot to perform this procedure. There are occasions where the robot may be helpful with ENT surgical procedures, but this is not one of them. N.J. surgeons on the cutting edge in fight against sleep apnea.